DesignCurial visits the Age of Terror: Art Since 9/11 exhibition, and speaks to some of the artists, delving into the stories behind the artwork. Not immune to its own conflicts, the Age of Terror: Art since 9/11 exhibition went through a series of changes before the final name and structure was decided upon. 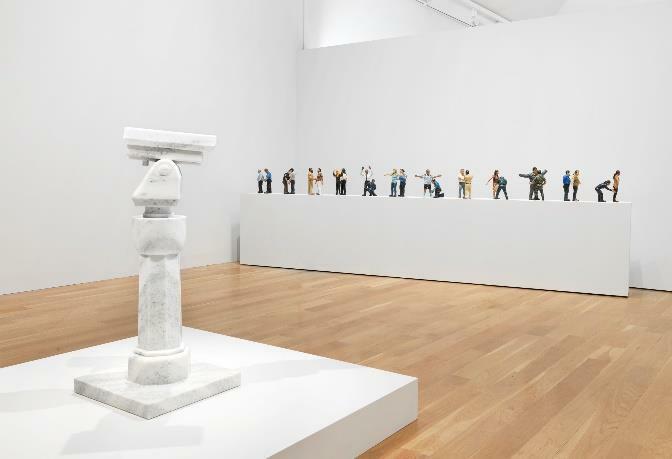 Previously called ‘States of Emergency’, the original set up of the exhibition featured artists from East and West in tandem; however, you will now find that the works are separated into various regions. Despite the difficulties that arose during the project, there is a vast array of art on display, from multiple creative disciplines. Tony Ourslers’ documentary 9/11 (2001) is an immediate and hard hitting reflection from the perspective of New York civilians post Ground Zero; its ordinariness is disarming and surprisingly insightful. Hanna Malallah’s My Country Map (2008) is a poignant and chilling reminder of the disrupted and fractured nature of her home country, Iraq. Meanwhile, Hrair Sakissian’s Homesick (2014) delicately captures the slow, burning heartache felt by those who abandon relatives in war zones - knowing that every day could be their last. Curator Sanna Moore explains that the incredible art work on display was painstakingly chosen from a vast array of each of the artists’ collections. Discussing how the exhibition started, Moore mentions that “Gerhard Richter’s painting and Grayson Perry’s vase were two starting points very early on in the show…those were the two beginnings”. However, it was only artist Kalid Walid who was offered the opportunity to produce new work for the exhibition. Walid is originally from Iraq, a country which regularly threatened with violence; his exhibition commission, Floodlands, (2017), explores themes of destabilisation and instability with a fictional map. It appears to be stable, but is ultimately disfigured and barely rests upon the wall where it stands. Walid explains that the work “considers the strain created by a series of violent conflicts that have engulfed our region, characterised by instability, border demarcation and waves of migration”. Image: © IWM. Kalid Walid's Floodplains (2017), commissioned by the IWM amd exhibited as part of Age of Terror: Art since 9/11 at IWM London. “The piece looks into the configuration of a region that was ineptly formed in the early twentieth century, insensitive to the needs and aspirations of socio-political change,” he continues. 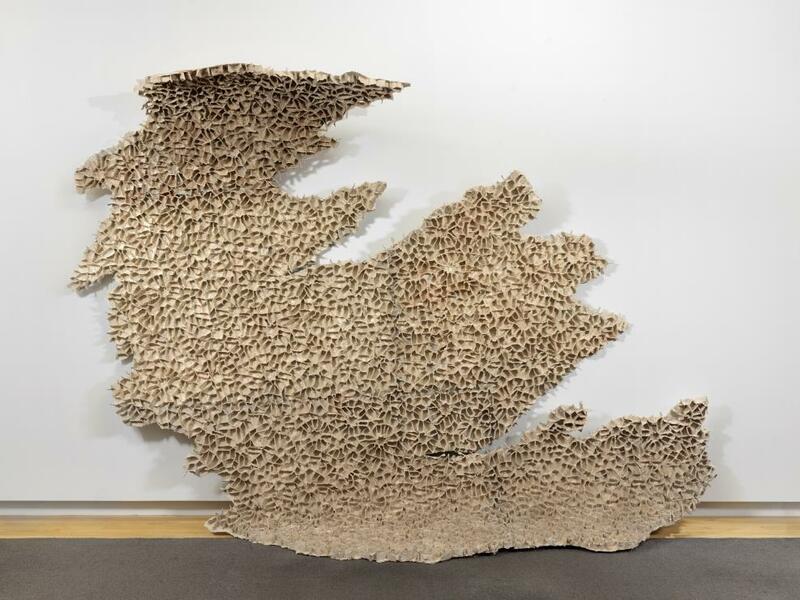 “The work in my installation ‘Floodlands’ attempts to deal with these issues with a shape of a fictional map made from hardboard, plaster, grout and acrylic paint - a unified appearance, yet disintegrating archaic system”. Creating such a nuanced and insightful piece meant Walid drew heavily upon his personal experiences and heritage. "I am a Kurd,” he reveals, “who came from a small community, brought up in a troubled town in the mountainous area of Iraqi Kurdistan a place that experienced waves of suffering". Image: © IWM. Ai Weiwei’s Surveillance Camera with Plinth (2015) and Jitish Kallat’s Circadian Rhyme 1 (2012-2013) exhibited as part of Age of Terror: Art since 9/11 at IWM London. Another artist with work featured at the exhibition is Jim Ricks; the Irish-American artist comes from an altogether different background. 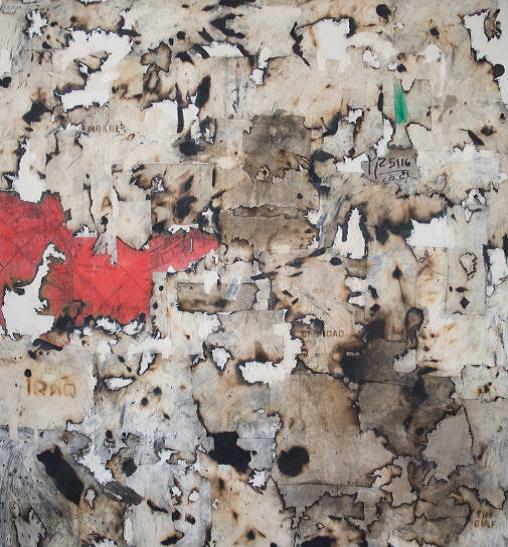 Having visited Afghanistan as an artist, war didn’t shape his life in the same way but the terrorist act of 9/11, and his country’s foreign policy, has certainly influenced his art. Jim Ricks' labour of love, the ‘Predator (Carpet Bombing)’ rug collection, stitches rudimentary military sketches of US military drones - used in Pakistan and Afghanistan - onto traditional Afghan rugs. Ricks explains the paradox of using the sketches; “it’s taking something very new – this sort of catalogue of the drones - and then something very, very traditional that has thousands of years of history. To be able to make that in Afghanistan was the perfect way to tie it together”. Image: © IWM. 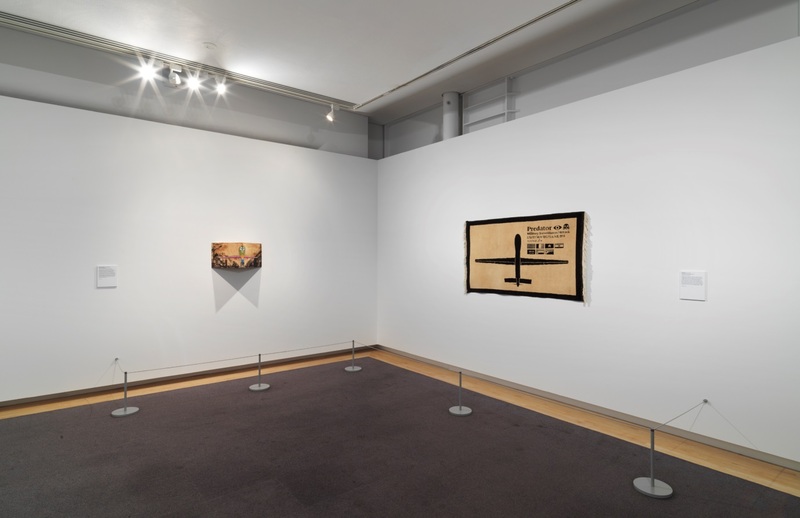 Jim Ricks' Predator (Carpet Bombing) (2016) exhibited as part of Age of Terror: Art since 9/11 at IWM London. Ricks mentions that the cultural significance of rugs in the Middle Eastern region is one of the major influences of his artwork. “[That’s what] the piece is about - it’s a Persian carpet. Carpets are a social space in Afghanistan. If you came into my shop, I’d invite you to sit down on the carpet and give you a cup of tea... to me, that’s really important it’s not just a decorative thing. It’s a functioning social space, and it becomes totemic of culture in general, of old Afghan culture”. Asked what the locals in Kabul made of his design, Ricks laughs. “They thought it was like a really strange piece of tourist kitsch - they wouldn’t have it in their houses, I was told, because this is the opposite of what they want”. But, Ricks continues, “I suppose that’s my point of the piece. It’s about these cold steel warplanes in contrast with the material found in a social space. They want something traditional - that was the only comment I got. There was no issue of it being improper or offensive or anything”. “There’s a history of depicting war imagery in Afghan carpets,” Ricks explains. “For example, [after] 9/11 there were carpets in Afghanistan made depicting what happened at the Twin Towers… US military leaflets were included [in the rugs] shortly after - as a way to show it wasn’t an expression of aggression or anti-American. [After this, the rugs] included a dove, an Afghan and an American flag. So there’s this idea of things being introduced from the outside and I think if you look at them, the Twin Towers ones are an obvious example of outside influences seeping into the culture”. Image: © IWM. James Bridle’s Drone Shadow (2017), installed in the atrium and surrounded by real-life objects of war at IWM London. One of the artists featured at the exhibition, Mahwish Christy, has previously worked with the Imperial War Museum - including showcasing solo exhibitions for the space. It makes sense; her bold, colourful take on drone warfare is striking and stirring – it begs the question, why create art around this theme? “As a Pakistani born American citizen,” she begins, “I find myself in the middle of conversations about the US drone program, especially when I am visiting back home. Observing this warfare from both perspectives, it became clear to me that it is not only affecting the lives of Pakistani civilians living at the border of Afghanistan but also the drone operators in Nevada”. Image: © Mahwish Christy. By The Moonlight (2013). Chosen from a larger collection of her work, Christy’s artwork within the Age of Terror exhibition brazenly depicts a drone in a multitude of colours against a muted landscape. 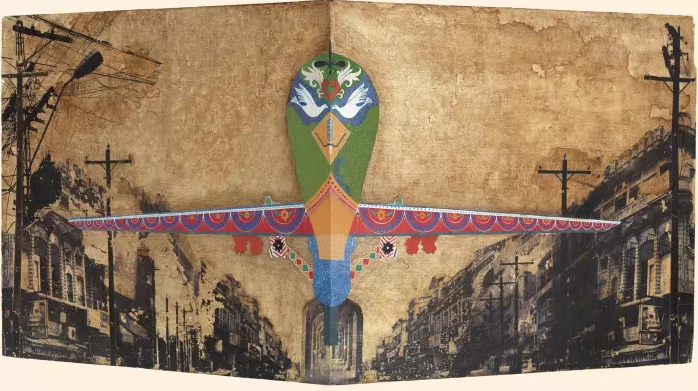 “The colourful paintings and sculptures, coded visual language, street vernacular - and even exhibiting these artworks in public places - is all part of highlighting the complexity of this drone war,” Christy reveals, discussing the artwork. “The deadliest animals in the world [have] bright colours - like these paintings. The question comes to mind, is this a warning or an invitation?”. 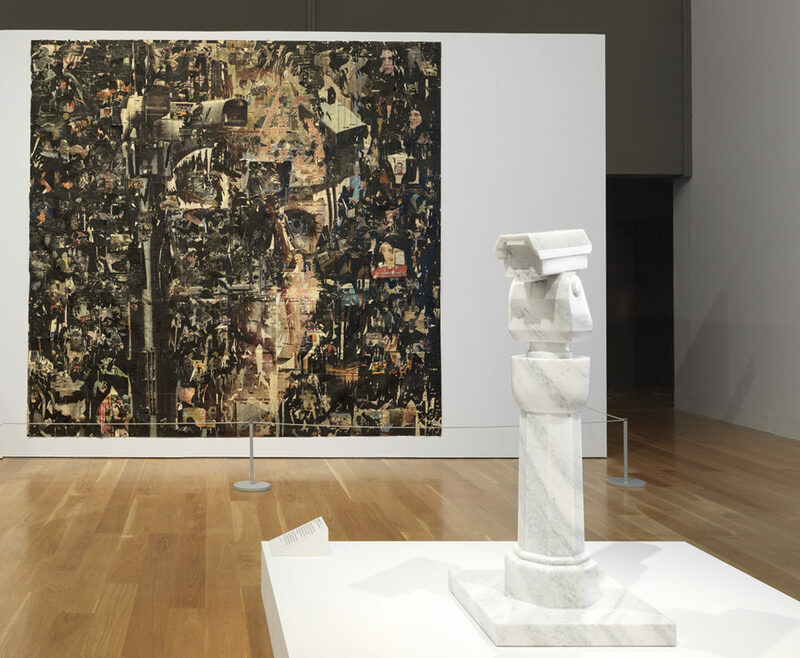 Another eye catching artwork is the expansive collage by Kennardphillips, titled Head of State. It was created by collaborators Cat Phillips and Peter Kennard, who began working on their anti-war agitprop after converging at a 'Stop the War' meeting in 2003. Ever since, they have been creating art to try and critique government policy. Image: © IWM. Kennardphillips Head of State (2007), exhibited as part of Age of Terror: Art since 9/11 at IWM London. “Our approach is very much as citizens, protesting against Government foreign policy and the play out from the point of invasion,” Phillips explains, mentioning that the pair encourages others to make their own unique anti-war art. Head of State, for example, “was made very much in protest to what was happening domestically - the changes in legislation under the auspices of the war on terror”. The other half of Kennardphillips is renowned anti-war activist, Peter Kennard. He mentions that Head of State was also “about surveillance, and the guy who got killed, Jean Charles Menezes. It had elements of what was happening in this country, with Blair’s image and his mad eye looking out onto the middle of it. We wanted it [to be presented in] a very fragmentary, torn down sort of way”. Though it is a shame that the artwork doesn’t appear in a cohesive layout, the eclectic range of artists on display make the Age of Terror: Art since 9/11 a truly remarkable exhibition. If you have the time, put aside an afternoon to visit the gallery – the documentaries on show deserve to be watched in full. For those passionate about politically informed art, Age of Terror: Art since 9/11 is a challenging, thought-provoking exhibition that is too good to miss. 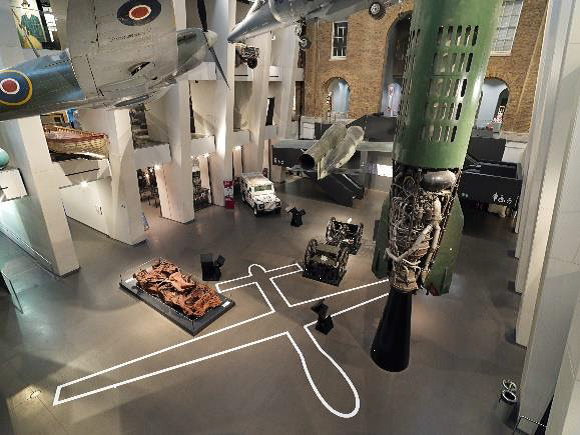 Age of Terror: Art since 9/11 is on display at the Imperial War Museum until May 28th. Feature image: © IWM. Hans-Peter Feldmann’s 9/12 Front Page (2001), exhibited as part of Age of Terror: Art since 9/11 at IWM London.